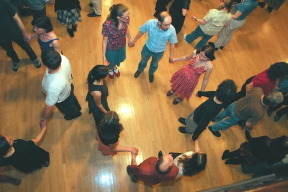 Like your grand­parents’ barn dance without the barn — old-time squares & reels, maybe a polka or a contra as well. Totally retro — try it! (Or your wedding, or your pig roast, or your vege bacchanal, etc.) In the meantime, we’ll post all the retro opportunities to dance here. If you know of any events that should be included, let us know that as well. 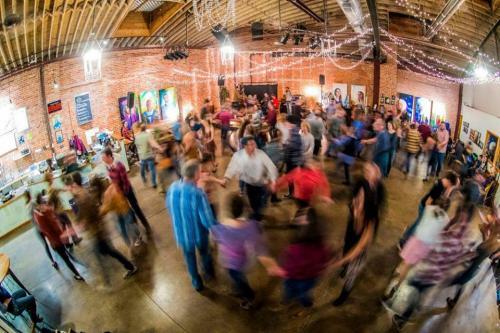 "The Biggest Little Festival in America"
Please join the Central Rockies Old-time Music Association for the 3rd annual FoCoMX Barn Dance! This event is structured for those that don't normally dance. Really, no experience is necessary. We will teach you what you need to know as the night progresses. Come alone or with a partner. Squares, reels, and circles all night long. Hard driving fiddle music by the New Pleasant Valley Stringband and dance calling and instruction by Chris Kermiet. Saturday Night - 5:30 to 7:30 pm @ Old Town Square | All Ages | Free! for reminders of upcoming events.